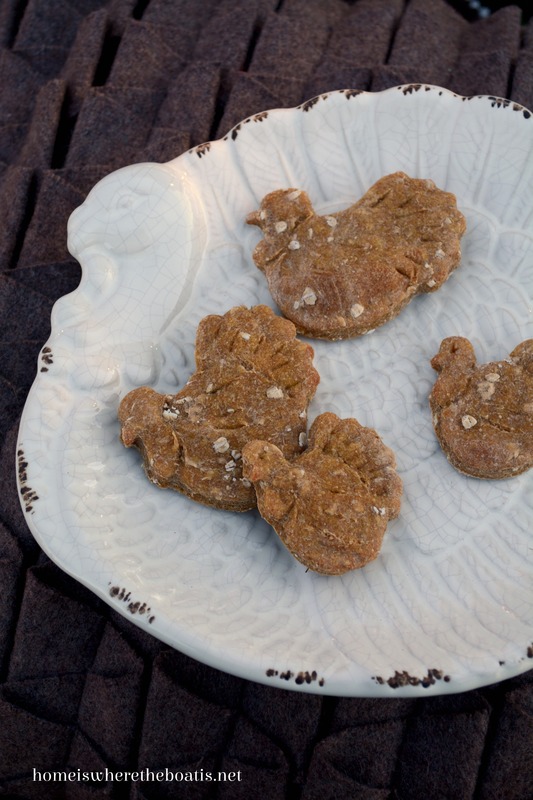 Dog Gone Good Thanksgiving Pumpkin Treats! 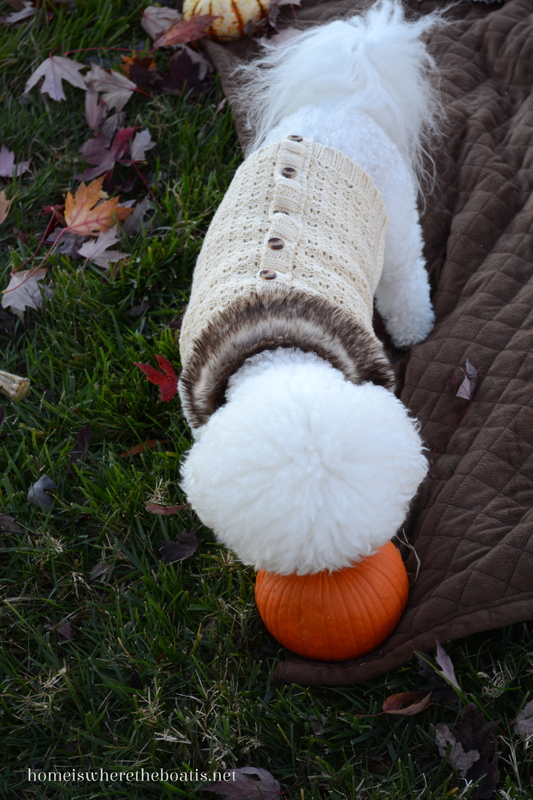 sure to be gobbled up by your canine companions! along with a few treats broken into pieces for a game of hide and seek. These treats are full of good and healthy ingredients . .
Applesauce, oatmeal, whole wheat flour, and pumpkin! 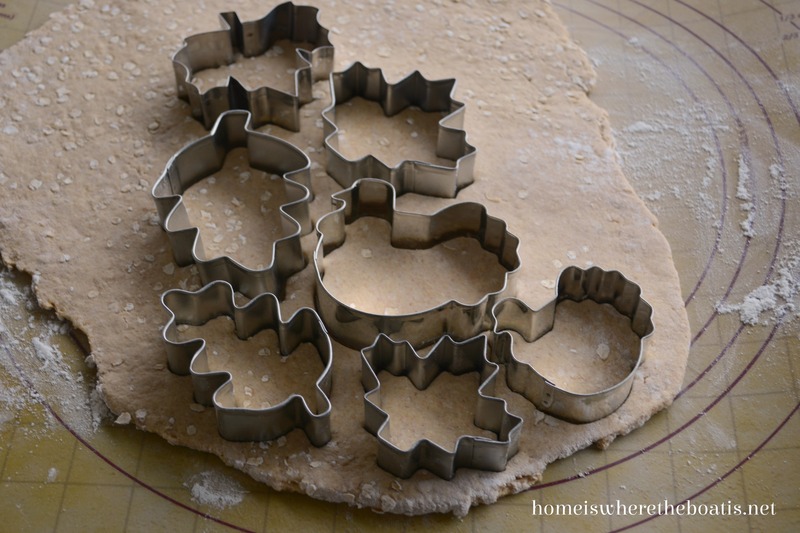 Makes approximately 5 – 6 dozen treats depending on size of your cookie cutters. They can share them with their canine friends for the Thanksgiving feast. . .
Presley, Copper, Maddie, Solo, Penny, Smitty, Pink & Blue, or they freeze well too! In a large mixing bowl, combine applesauce, egg, pumpkin, vanilla & water. In a second bowl, combine flour, cornmeal, cinnamon and *1/2 cup oats. Turn dough onto floured surface and knead. 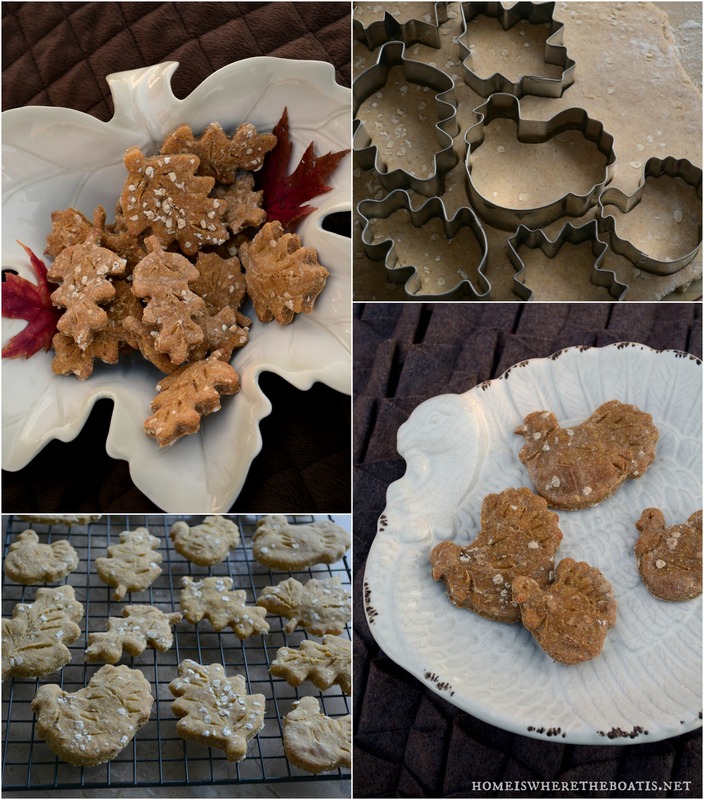 *Sprinkle reserved ¼ cup oats on top of dough and roll out to ¼ inch thick and cut into shapes. Add additional flour as needed if dough is too sticky. 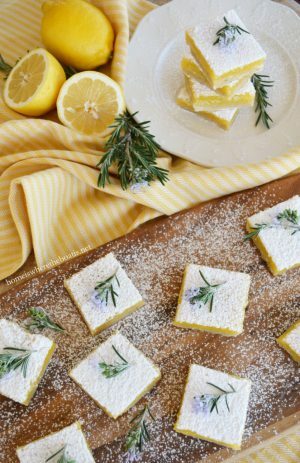 Place on parchment or greased cookie sheet and bake 25 – 35 minutes, depending on the size and your oven. Watch and remove when slightly browned. Cool on a rack and store in sealed container. *You can mix the entire ¾ cup of oats in all at once with the other dry ingredients if you prefer. Score lines for veins in the leaves and turkeys and sprinkle oatmeal on tops if desired before baking. 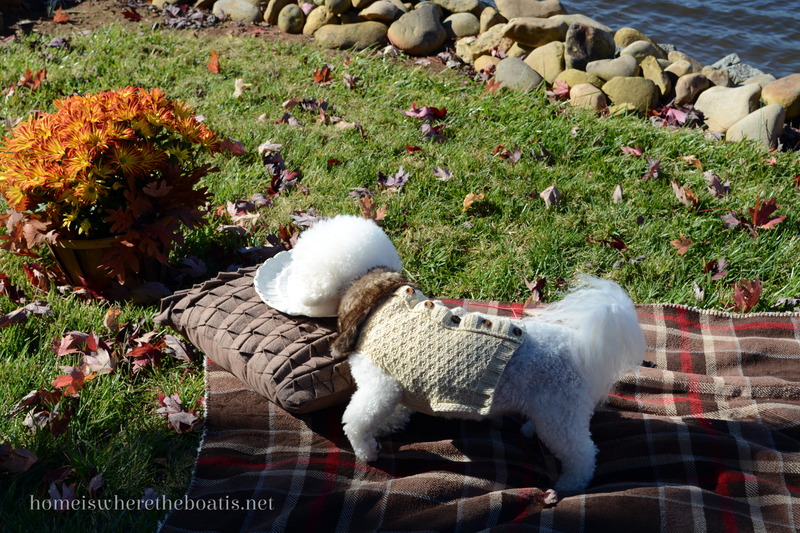 Your four-legged friends will beg for them either way and won’t give a woof :) about turkey or leaf plates. forget to bark at passing fishermen. 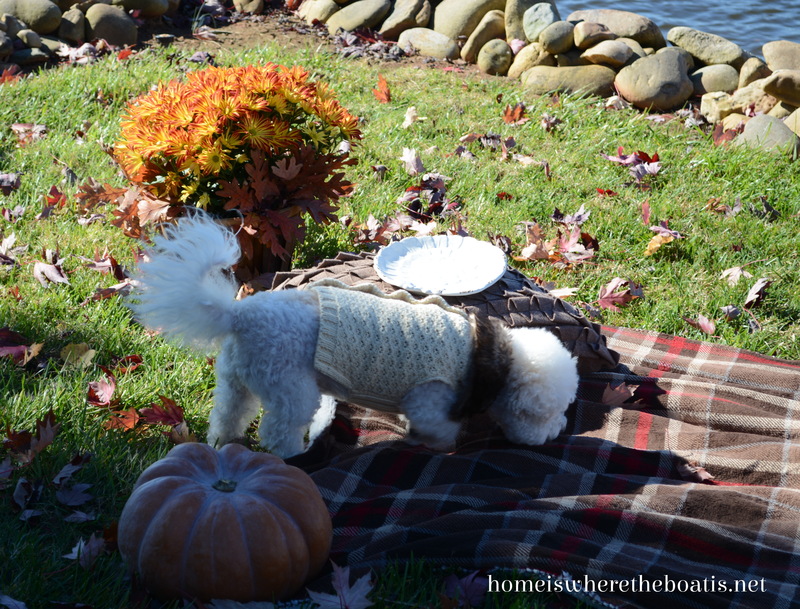 . .
Dog Gone Good Pumpkin Treats! They are so darn cute!!! Where did you get their sweaters? I would love to get one for my girl. Chloe and Grace are adorable as always, especially so in their soft snuggly sweaters. 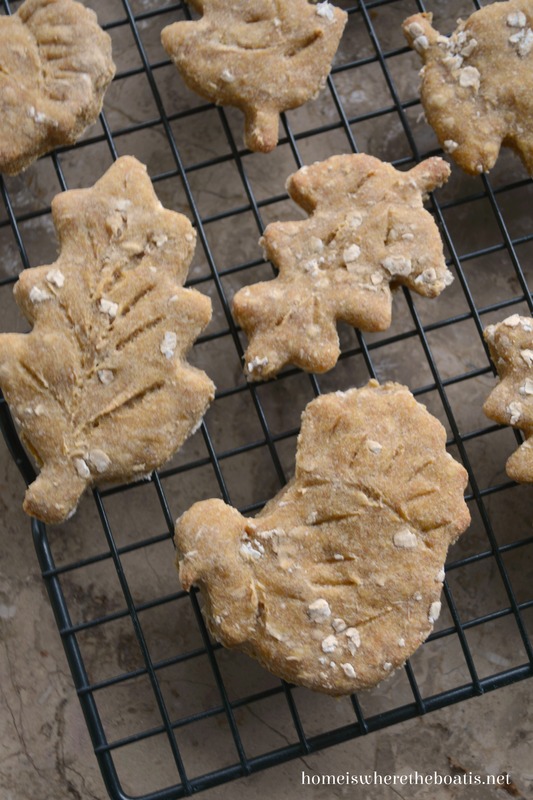 I will definitely make these treats for our sweet Coconut #cotongrandog. Pumpkin is his favorite, so I know he’ll enjoy these treats long after Thanksgiving is over. Thank you for sharing, and Happy Thanksgiving. 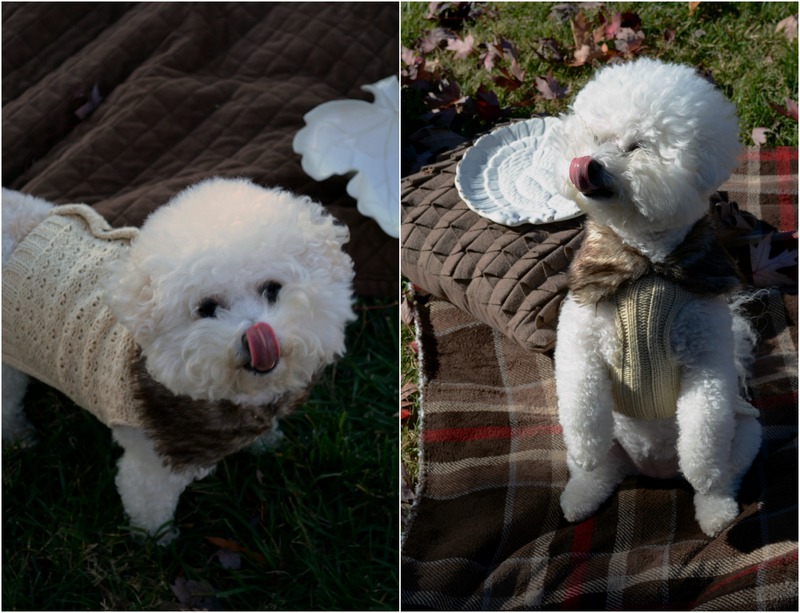 Aww..Chloe and Gracie are so cute in their little sweaters, and their treats look yummy with all that natural, home made goodness. Gosh you always find the neatest cookie cutters. 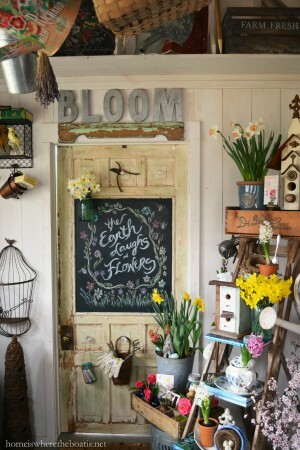 Thanks for another darling C&G post. Great doggie treats! 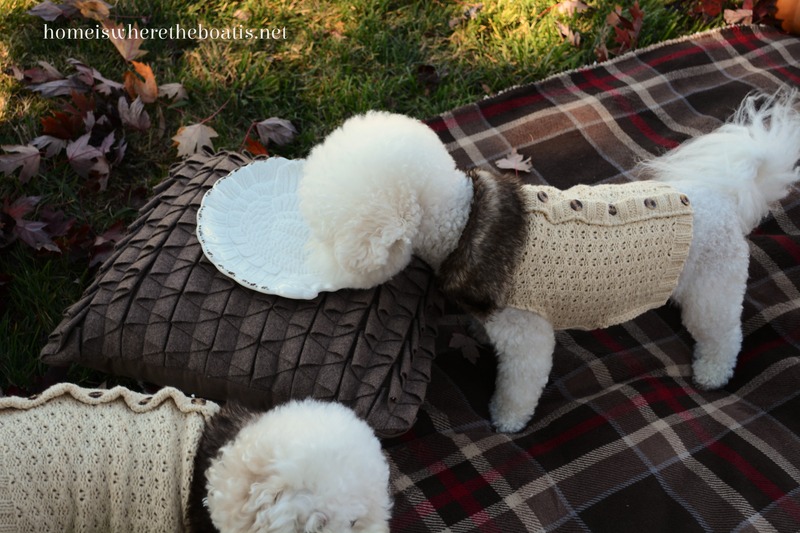 My Bichon , Bear, will love them! Have a great Thanksgiving. P.S. I do love the sweaters! Warms my heart! 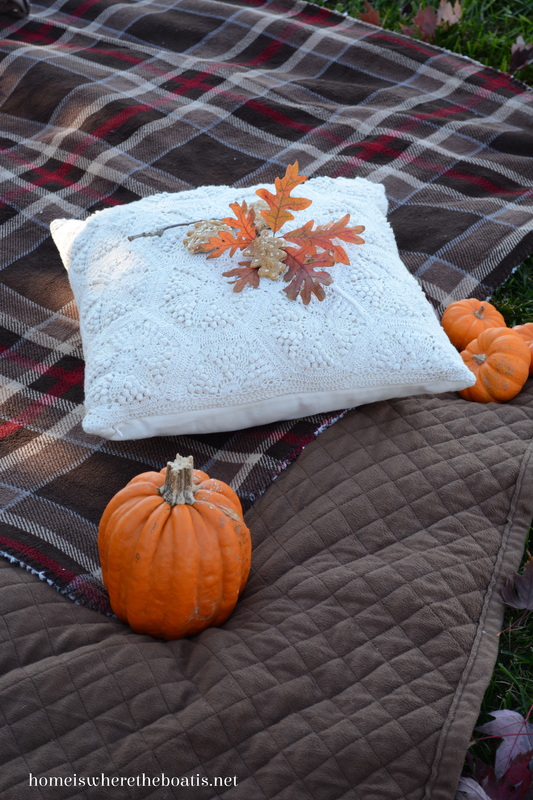 So thankful for you and Chole and Grace…have a wonderful Thanksgiving! Omg..what a cute post..your furbabies are adorable. Looks great! So happy to know that I’m not the only one that bakes for my dog! 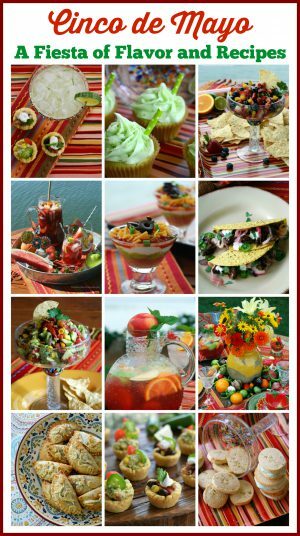 I will definitely be making these this weekend. Thank you for the recipe! 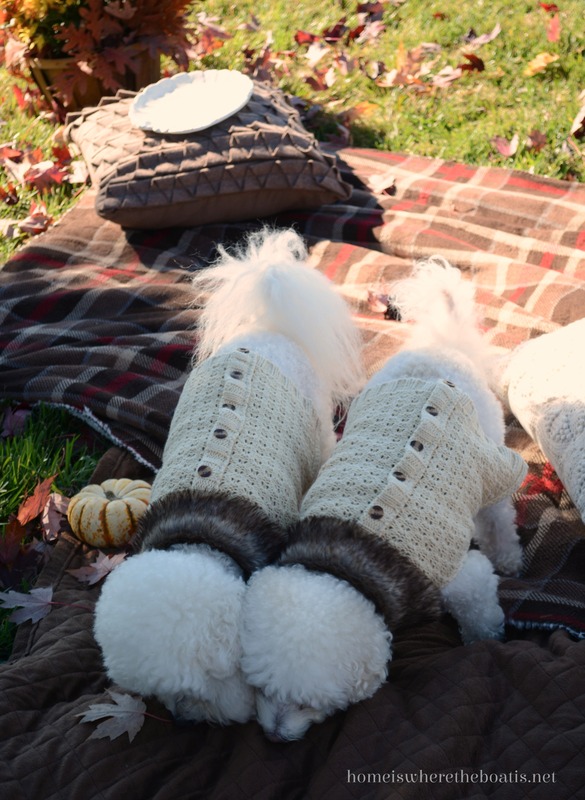 What else but a cable knit sweater with a mink collar would a stylish pooch wear for a canine treat filled picnic! This is just TOO cute Mary, simply adorable!! 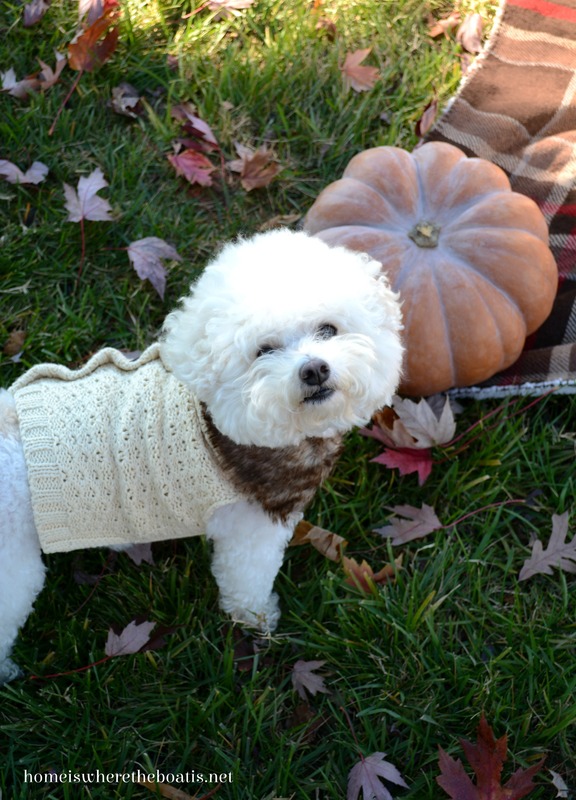 I would like a sweater vest like that myself :) Stay cozy! 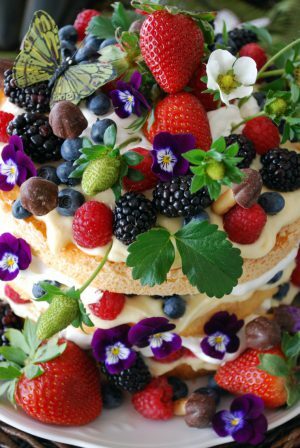 Will have to make these treats for my girls, Casey and Abby. I’m sure they’ll love them! Thanks for the recipe. You’re such a great mom to your girls. 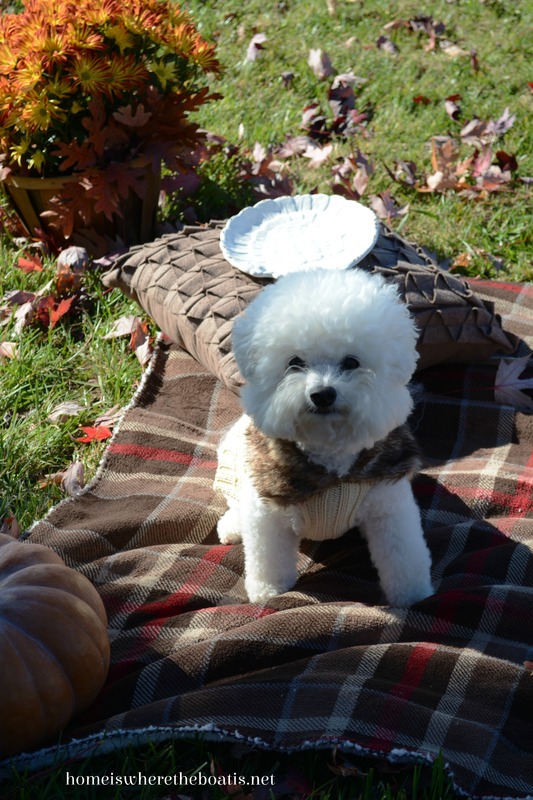 So adorable–and the treats look pupalicious! Can those two girls get any more adorable? Love the sweaters with the furry collar. Sadie is going to want to lick the screen. 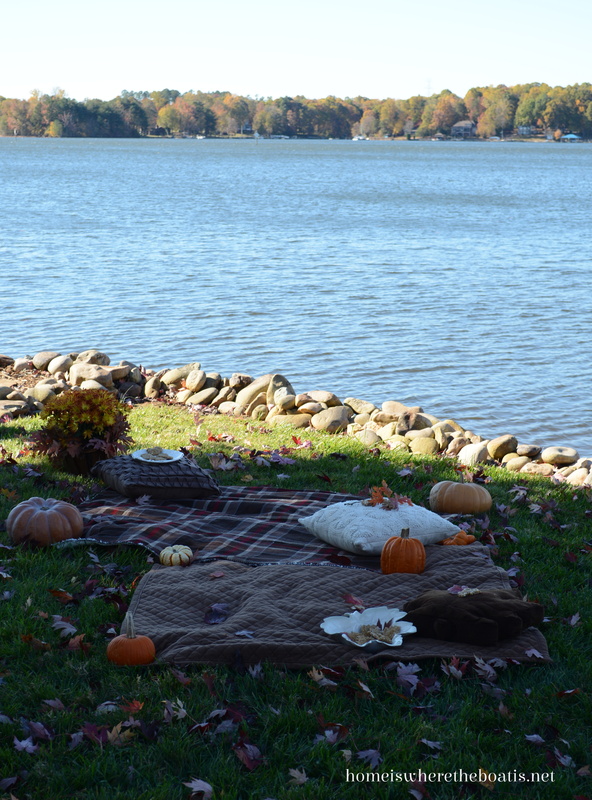 Happy Thanksgiving to you and the girls………Sarah and Sadie. Chloe and Gracie are just too adorable! Oh my gosh, Mary, look at your Chloe and Gracie just licking their chops! 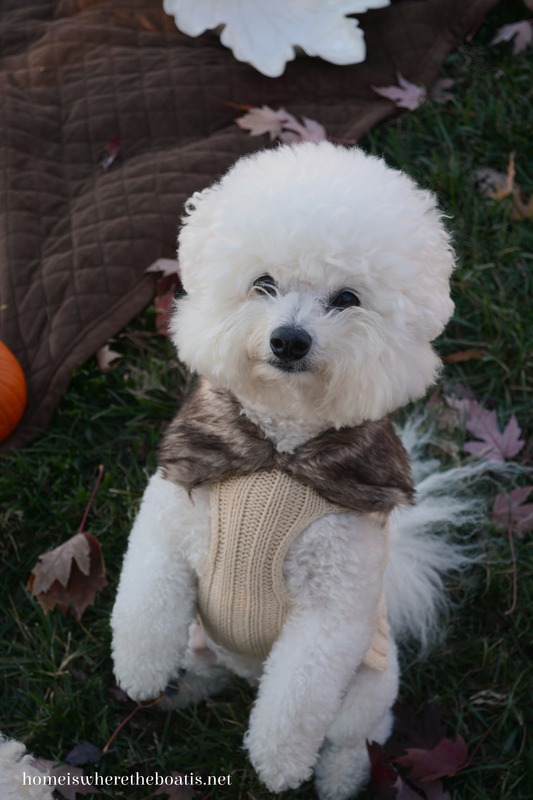 They are the most adorable dogs and they’re looking so fashionable in their fur trimmed sweaters!! I think your treats are a major winner. 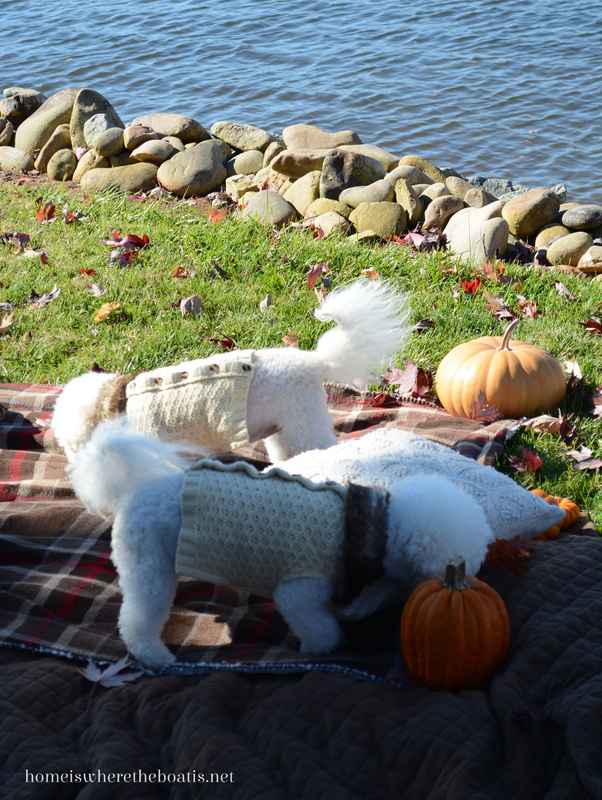 I see The Girls got new sweaters in addition to the great treats Mary! No doubt these with the buttons on the back are a bit easier to put on… I remember wrestling with The Brat putting that one that pulled over her head on:@) No doubt the recipe is doggone good! Mary, I always enjoy seeing pictures of your darling girls. 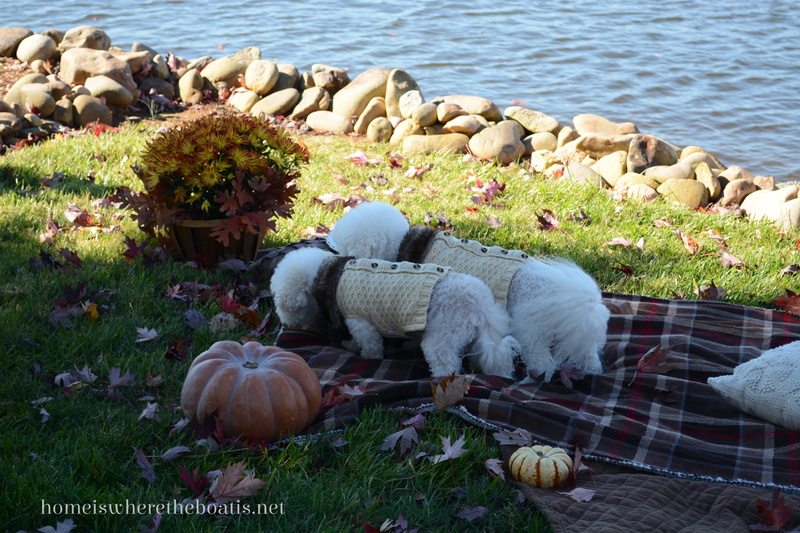 They look adorable in the sweaters and it looks like these treats were a big hit. Happy Thanksgiving! They are the cutest and happiest girls…and they are always dressed so tres chic!!! Thank you for sharing. Your babies are precious. 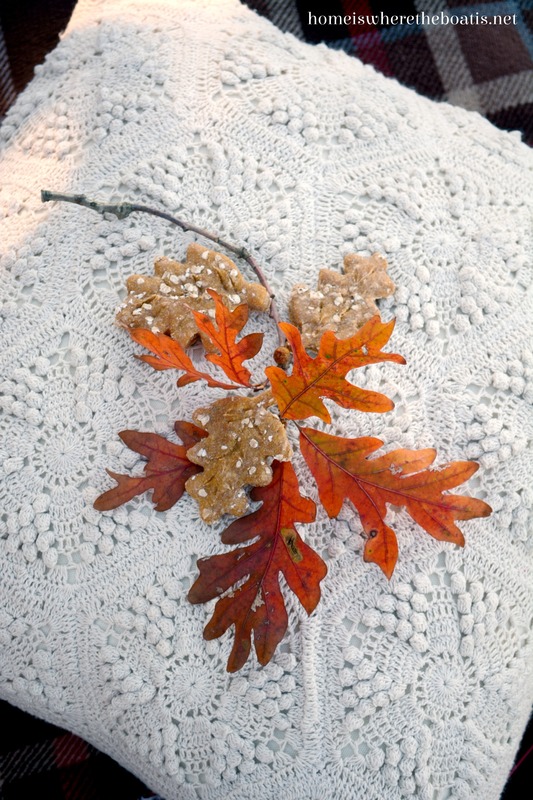 Tell us about the crocheted pillow. Loveit. Your girls are so beautiful; I do have a question for you-beside where you got the beautiful sweaters-my groomer told me not to let Hunter wear a sweater or coat inside during the winter because it would ruin his soft, wavy hair. Have you had any issue with this? Also, I’m going to make these treats and give them to our furbaby friends. Thanks for sharing. Happy Thanksgiving to you and yours. Wow, those last two shots are amazing! They are adorable and lucky pups! Oh, my, gosh! These photos of Chloe and Grace are just precious! I love their expressive looks on their faces! They seem to be saying, “Thank you, Mommie!” I’m sure Lucy would love these treats, too. Thanks for the recipe and I hope all of you have a happy Thanksgiving!